Since we first opened our doors in July of 2008, Posterous has continued to find new and better ways to make sharing simpler, more fun, and just plain awesome. It’s a commitment to never-ending improvement that runs through every bone in our body, every thought in our mind. 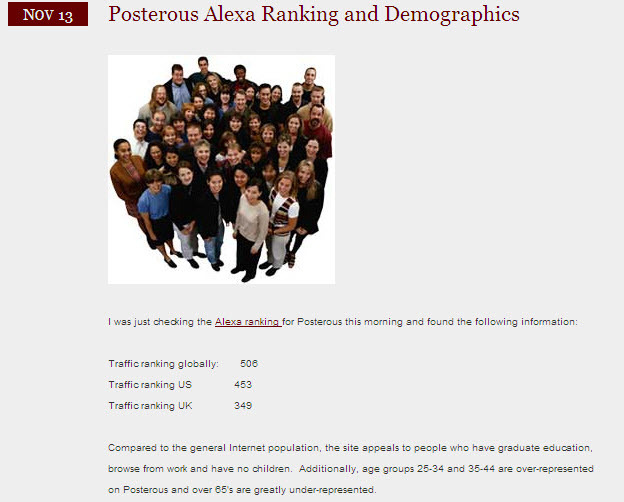 Since that time, Posterous has achieved a Google Page Rank of 7/10 and is ranked in the top 500 sites in the world in terms of traffic (refer the excerpt from an email post to my Posterous account shown above). The ease of this site is highlighted by the fact that you can create your account just by sending an email to post@posterous.com – and including a subject line. The subject line of the message becomes the blog post title. You can attach most types of files and Posterous will post it along with the text of your email (the blog post). Posterous will convert the files to the most web friendly format available. It will resize individual photos and convert attached multiple photos to an image gallery. So via your email you can post videos, photos, documents, audio files and links. If you attach an MP3 file, Posterous converts it to a Web MP3 player. An attached video file becomes a flash player. URL’s (web addresses) are converted to hyperlinks and a YouTube link in your Posterous email is converted to an embedded YouTube player. Posterous can also convert URL’s from other video sites. The email blog facility provided by Posterous is incredibly flexible and easy to use. Email blogging gives you a quick and easy way to communicate information. Posterous also offers you the option of editing your email blog online via a simple HTML/text editor. Simplicity is the essence as far as Posterous is concerned and the email blog option provides busy small business owners with a quick and easy way to market online by sharing ideas and files on a high traffic site.